How do we know Kate Hepburn was one of the greatest actors ever? Because inside her soul, she was a boy named Jimmy. Biographer Bill Mann explains. We all know Katharine Hepburn was the woman who wore the pants. But was her iconic embodiment of the independent-spirited American woman really a carefully cultivated image that masked something else? “I would consider ‘transgender’ a better way to understand Katharine Hepburn than anything else,” says out novelist and Hollywood historian William J. Mann. His latest biography, Kate: The Woman Who Was Hepburn (Henry Holt and Co., $30), explores with unprecedented frankness the star’s fluid sexuality and gender identification. Mann sheds new light on Hepburn’s complex relationships with gay or closeted bisexual men, including her legendary love, Spencer Tracy—who, Mann reveals, was at least bisexual in terms of his sexual attractions and interactions. When Kate was excerpted in the October issue of Vanity Fair, revealing that Tracy had enjoyed the paid favors of a male gas station attendant and that Hepburn’s love life included several female lovers, a flurry of headlines screamed that Tracy and Hepburn were bisexual. According to Mann, Why not me? I’m a boy too! was young Kate’s inner refrain. “It was as though she were saying, ‘OK, I can understand if you don’t want to let girls do that, but I’m not a girl.’ That’s why she shaved her head and called herself Jimmy. 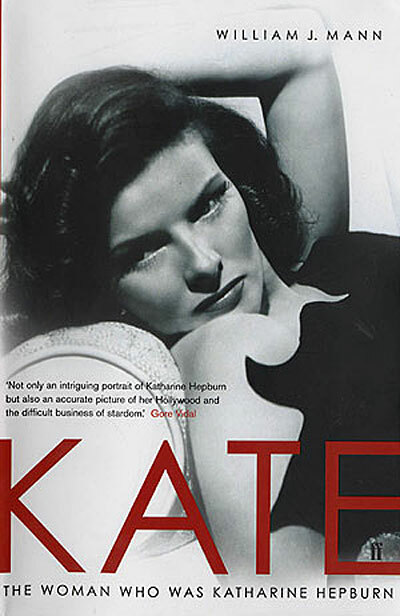 During the exhaustive research for Kate, the biographer read a copy of Hepburn’s unproduced autobiographical screenplay, written in 1987, titled Me and Phyllis. The screenplay has never been available to the public, and Mann didn’t quote it because Hepburn’s estate owns the rights. “It describes her in terms you understand,” Mann says: “ ‘I’m still Jimmy Hepburn in my heart and my soul.’ Kate once told Barbara Walters, ‘Fifty years ago I put on pants and walked the middle road.’ She’s said many times, ‘I’ve lived my life as a man.’ ” Similarly, she told columnist Liz Smith that she had never related to the world as female. “She was telling us, in her own words, ‘I am not what you think I am,’ ” Mann says. Nor was the celebrated Tracy-Hepburn romance a fiction. Like everything else in her life, it was more complicated than that. Mann’s book notes that Hepburn identified with straight men, but it was only with women “that she could set Jimmy free and be herself; rare was the man who could tolerate such a paradigm.” Later iconic images such as cutting logs and swimming in the icy waters of Long Island Sound off the Hepburn estate at Fenwick, according to Mann, were not necessarily merely images of an empowered woman; they may have been more akin to a man in a woman’s body. Still, even the author cautions against applying 21st-century gender definitions too literally at the risk of setting up language paradigms that weren’t available to women of Hepburn’s generation. Perhaps if she were growing up today, Hepburn might even have used the term herself. “I think that, had she lived in another time,” Mann says, “she might have been open to that discussion."